Back cover blurb: Meet Hannah Halloran. Wife of Sean, mother of teenage Zac and little Oscar. Their comfortable home is in a suburb of a city unaffected by the deadly flu that's killed thousands. But Hannah is tense. She's worried about Zac's vulnerability miles away at a crowded summer camp. She's uneasy about Oscar's boisterous play with the children at his school. Is physical contact wise when an epidemic is coming closer? Hannah fears that their safe little world is about to be blown apart. And she's right. It's time to get Zac home - if they can... As the virus traps Hannah and her family in their neighbourhood and then within their own home, supplies of food, water and electricity dwindle. The battery life on their mobile phones fades, cutting them off from critical news bulletins. Sean's confidence that the government will keep everyone safe is misplaced. Every day, Hannah has choices to make that will decide whether they live or die. Choices with devastating consequences. Just how far will she go to protect those she loves? Originally published under the title AN ORDINARY EPIDEMIC. The Manba Virus is sweeping the world, the epidemic that has been likened to Bird Flu but even more deadly, is causing airports to be shut, ports to be locked down and people to be extra vigilant. Hannah is extremely vigilant, some might say too vigilant. Particularly her husband Sean. But Hannah has survived cancer and isn’t about to let a pesky virus take down her family. As Hannah starts stockpiling supplies, not going to work and keeping her youngest son home from school as a precaution, those around her worry about her anxiety levels. But Hannah isn’t the one that they need to be concerned about. By the time the Manba Virus hits Sydney, Hannah and her family are practically the only ones in the neighbourhood that had the foresight to be prepared. They shut themselves in, accept only online grocery deliveries left in the porch to avoid contamination, and wait for the Manba to pass. But Sydney itself is not prepared for the virus to hit, it spreads quickly killing thousands, worse than anyone could imagine, and it does not pass quickly. As electricity and water supplies fail and the family’s food supplies begin to diminish, Hannah almost wishes that she had cancer again-at least she knew her family couldn’t get that from her, and would be okay without her. 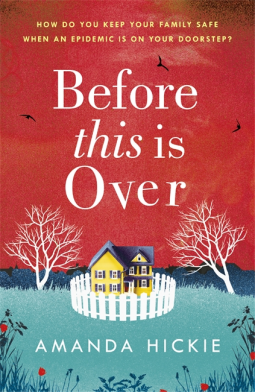 Before this is over is a very real novel, about a very real threat, no matter unlikely we think that is, the truth is no developed country has been faced with a virus quite like this yet, no one knows if we would be able to cope. Before this is over would make a brilliant film, it could be argued that the pandemic ones have been done to death, but this novel puts a different spin on it, and is not sensationalist in any way, it is what it is, real, gritty and beautifully written. Before this is over is available now via Amazon online and all good book shops.